When looking at the Bombardier CRJ900 Interior, you will find that it is designed to meet the needs of the regional jet segment while maximizing space and comfort. Inside the CRJ900 Cabin you will find that the interior height of the CRJ900 is 6 feet 2 inches (Aisle Height). 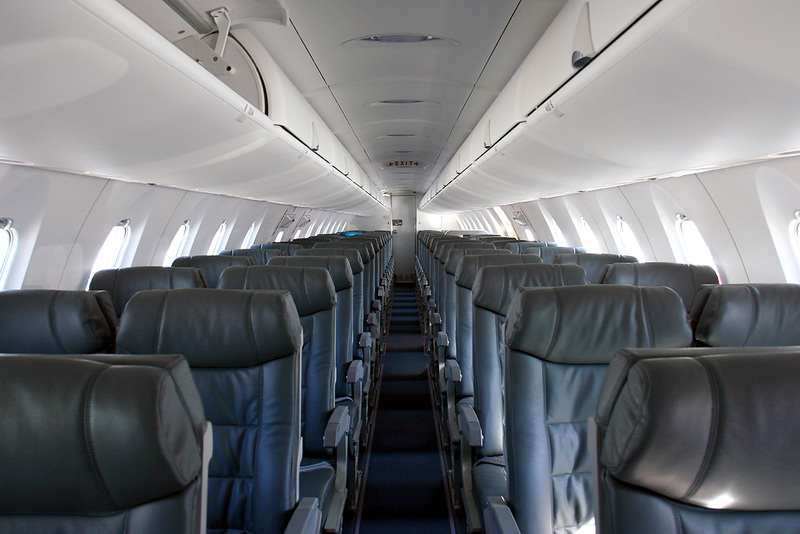 Bombardier CRJ900 cabins usually have 76 to 90 seats, depending on the airlines' choice for seating configuration. Most CRJ900 interiors have two lavatories, with one located in the front and one located in the rear of the cabin. The CRJ900 has larger overhead bins then the CRJ200. Dimensions of the CRJ900's overhead bins are about the same as the CRJ700 which measure 52.5 inches in width, 14 inches in height and 9.5 inches in depth. Seating in the Bombardier CRJ900 Interior is configured a two class or one class cabin. Many airlines are operating CRJ900 with a first class CRJ900 cabin. There are usually 4 rows of 3 seats (total of 12 seats) located in the first class section. Seat pitch for these seats are usually 34 inches. The main cabin of the CRJ900 interior has seats configured in a 2 by 2 configuration with a seat pitch that is usually 31 inches. Newer Bombardier CRJ900s that are CRJ900 NextGen aircraft have upgraded interiors from earlier models of the CRJ900. Some of the improvements in the CRJ900 NextGen interior included larger overhead bins, better lighting with LED and larger windows. To learn more about the CRJ900 NextGen visit our Bombardier CRJ900 NextGen page. Above Bombardier CRJ900 Cabin - Interior Photo of an NextGen CRJ900 by Konstantin von Wedelstaedt on Wikimedia Commons. Photo (only) released under the GNU Free Documentation License, Version 1.2. The Bombardier CRJ900 interior - cabin is also called Bombardier CRJ9 interior - cabin, Bombardier CR9 interior - cabin, Bombardier CL-600-2D24 interior - cabin, Canadair CL-600-2D24 interior - cabin or the Canadair Regional Jet 900 interior - cabin due to the various names for the CRJ900 jet.